by BRIAN CLARK What’s so magical about the number three? What’s so magical about the number three? It’s also no coincidence that some of the most famous quotes from throughout history are structured in three parts, nor is it surprising that the Rule of Three also works wonders in the world of comedy. This combination of pattern and brevity results in memorable content, and that’s why the Rule of Three will make you a more engaging writer. What the Three Little Pigs, the Three Blind Mice, Goldilocks and the Three Bears, the Three Musketeers, the Three Wise Men and the Three Stooges have in common? Why the three-act structure is the dominant approach to screenwriting in Hollywood? The Rule of Three works in stories due to the presence of the concise, memorable patterns that I mentioned above. But even if that wasn’t the case, the number three has been used so widely throughout some of the most memorable works from our childhoods, it’s likely that we are preconditioned to respond favorably to elements grouped in threes. Think in terms of three when crafting your content, and you’ll likely end up with a more engaging outcome. If at first you don’t succeed, remember: the third time’s the charm. You see the Rule of Three used all the time across diverse areas of life. Why? The United States Marines are big believers in the Rule of Three when it comes to getting things done and keeping people alive. The Corps apparently experimented with a rule of four, and retention and effectiveness took a nose dive. If you want something stuck in someone’s head, put it in a sequence of three. One of the best examples of the power of the Rule of Three is in the world of comedy. Again, three is the smallest number of elements that can form a pattern, and comedians exploit the way our minds perceive expected patterns to throw you off track (and make you laugh) with the third element. I can’t think of anything worse after a night of drinking than waking up next to someone and not being able to remember their name, or how you met, or why they’re dead. 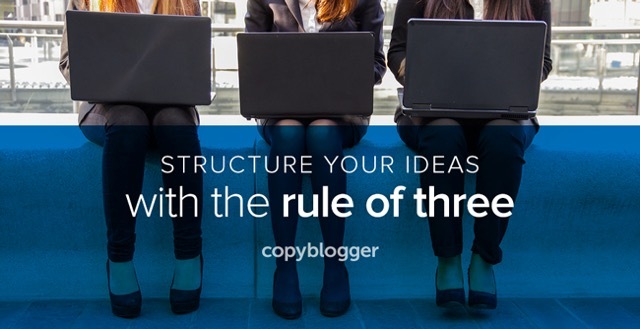 Using humor in your writing can be risky since some people just won’t get it, but using a Rule of Three approach is a safer way to make a funny. Professional comedians use it all the time, and that’s simply because it works. I truly do believe that a set of three bullet points is the most effective use of the format. You might also find that list posts with three items will draw people in, because you’ve boiled things down to the essence with no fluff. And there’s a reason why people like to be presented with three choices rather than two or five. When it comes to pleasing the human brain, it seems like three is simply a magic number. At least that’s what Schoolhouse Rock taught us as kids.